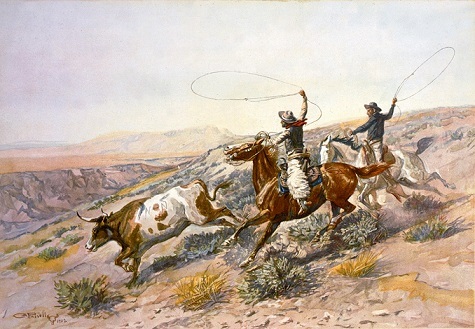 Texans cannot really claim they invented a Beef Fajita Recipe. They can certainly raise their hands if someone asks who made fajitas popular in the United States, though. Just exactly what is a fajita? And where did fajitas come from? A fajita is simply a meal with meat or poultry, vegetables, peppers and other ingredients cooked together and put into a flour tortilla. It is an easy meal to prepare and one of the tastiest meals you can make. The variety of fajitas you can make is limited only by your imagination! Beef fajitas came first. Mexican laborers created the dish out of necessity while working along the border between Texas and Mexico. Seems like they were partially paid with beef - supposedly the worst cuts of beef - something we call skirt steak today. But these ingenious workers learned to make good use of a tough cut of beef. They invented what we now know as fajitas. 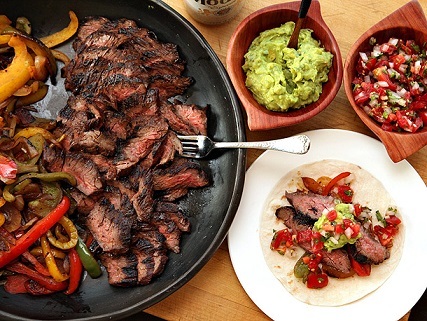 Fajitas are marinated skirt steak, plain and simple. Skirt steak at one time was one of the least desirable cuts of beef. 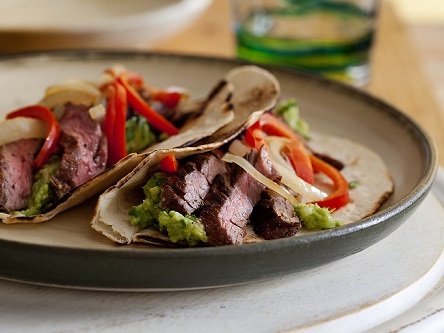 Now, because so many people love fajitas and other dishes that use the cut, skirt steak is no longer as inexpensive as it once was. And since everyone wants delicious and memorial meals, you should consider using flank steak to make fajitas. You can also use sirloin or tenderized round steak in place of the skirt steak. So the use of the word Fajita has evolved over time, and now Americans use the word to describe chicken fajitas, steak fajitas, shrimp fajitas, and so on. Today anything wrapped in a flour tortilla can be called a fajita. Originally, and still today, the meat used for a fajita is usually cut into strips, and placed into the wrap with a selection of vegetables (Bell Peppers and Jalapenos are very popular). Beef fajitas are made up of separate components and steps: the beef, the beef fajita marinade, chilies, onions, other vegetables, Pico de Gallo, salsa, and guacamole. 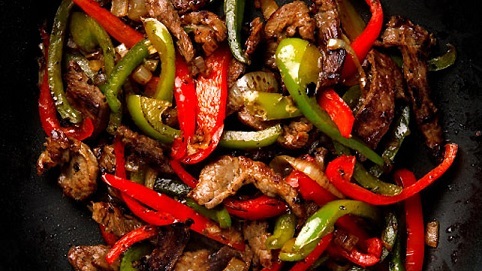 This beef fajita recipe includes the fajita marinade recipe you'll need. To access the other recipes you'll need with your beef fajita recipe, simply click on the links (underlined words). The secret to tender fajitas is marinating the meat, especially if you are using skirt steak, and a high heat with a short cooking time. The meat should be no more than 1/2 inch thick. Makes enough to marinate 1 pound sirloin steak. Makes 4 servings. Preparation time: 15-20 minutes. Serves 4-6. Roll the tortilla around your meal and enjoy! TA-DA! That's the beef fajita recipe and process. Easier than it looks, believe me. 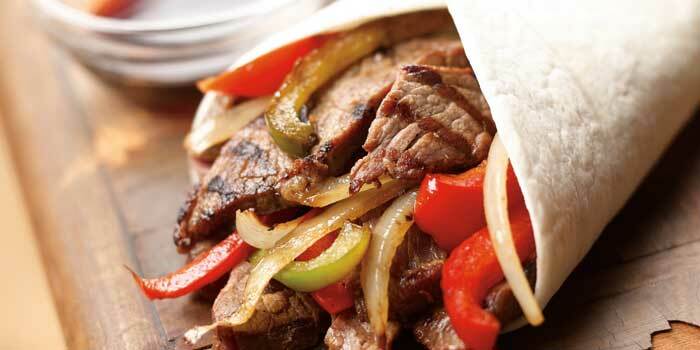 Enjoy your beef fajita recipe and the company of those you share it with! Did you know? Sonny Falcon, an Austin meat market manager, operated the first commercial fajita taco concession stand in tiny Kyle, Texas in September of 1969. That same year, fajitas debuted on the menu at Otilia Garza's Round-Up Restaurant in the Rio Grande Valley community of Pharr, Texas.